Clth, 9 x 12.5 in. / 120 pgs / 60 color / 25 bw / DVD (NTSC). Traditional portraiture proceeds from the assumption that we can learn about a person by looking at their face. But crucial biographical truths are rarely visible on the surface. Robert Weingarten (born 1941) addresses this with The Portrait Unbound, in which his "portraits" of 21 eminent Americans--among them playwrights, musicians, scientists, architects and actors--show not physical appearances but the subjects' memories and associations. Thus Stephen Sondheim is represented by musical staff paper and is superimposed on Seurat's "La Grande Jatte," and Colin Powell is figured in a somber composition based on the mausoleum-esque slabs of the Vietnam War Memorial. Other subjects include Hank Aaron, Edward Albee, Buzz Aldrin, Mikhail Baryshnikov, Chuck Close, Frank Gehry, Jane Goodall, Billy Graham, Dennis Hopper, Quincy Jones, Carl Lewis, Sandra Day O'Connor, Alice Waters and James Watson. Includes a bonus DVD. 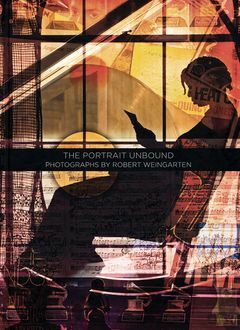 Featured image is Self-Portrait, reproduced from The Portrait Unbound: Photographs by Robert Weingarten. 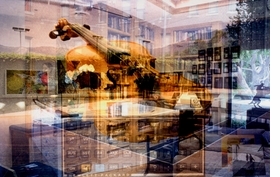 "Weingarten has been engaged in an effort to explore the world of images unseen or yet to be imagined. By keenly exploiting all the capabilities of digital technology, his goal is to orchestrate a dimensional shift in the way we think about the photographic image. His vigorous embrace of the digital paradigm has promoted ventures into new aesthetic terrain and a direct engagement with a mode of production that changes how and what we see in the culture around us." Julian Cox, excerpted from The Portrait Unbound. FORMAT: Clth, 9 x 12.5 in. / 120 pgs / 60 color / 25 b&w / DVD (NTSC). Published by High Museum of Art.